About: One of Britain’s finest Arts and Crafts Houses, Gidleigh Park was built as a private residence in 1928 in Dartmoor National Park in Devon. It became a country house hotel in 1977 and extensively restored in 2006. Today Gidleigh Park is one of the most elegant hotels in the English countryside with Relais & Chateaux accreditation. Michael Wignall is the new Executive Head Chef of Gidleigh Park, which for many years enjoyed 2 Michelin stars under the stewardship of Michael Caines. Wignall took up his new position in January 2016. Michael Wignall earned his 1st Michelin star in 1993, and has since then worked at some of the most prestigious hotel restaurants in the UK including the Latymer Restaurant at Pennyhill Park, where he achieved his 2nd Michelin star in 2012. 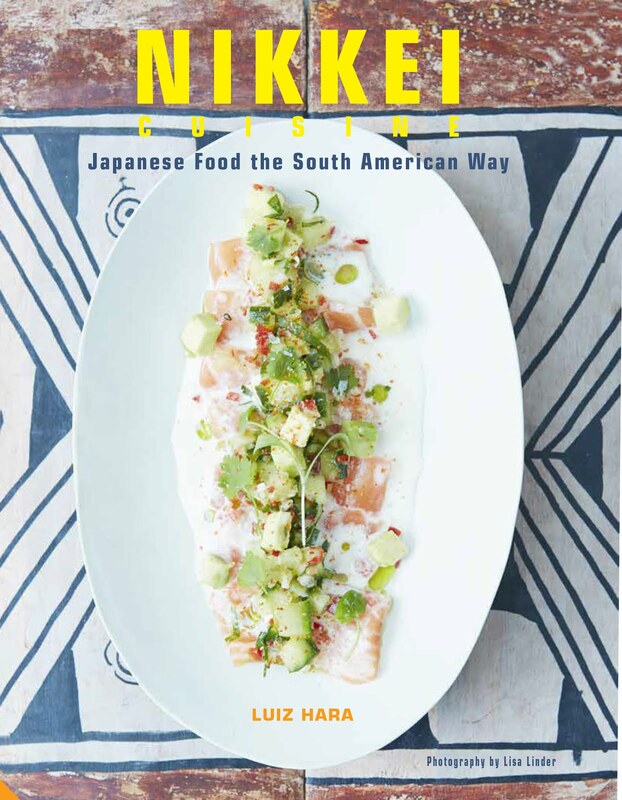 I was lucky enough to try his cooking in London as Wignall took part in a series of dinners at Selfridges in the summer 2014 namely Meet the Michelins, reviewed here. Besides some wonderful food, Gidleigh Park has stunning grounds offering great walks, peace and tranquility. There are several grand and comfortable public rooms on the ground floor, with log fires burning all day long. On our visit, service was friendly, very welcoming but unobtrusive – they got it just right. A four-hour drive from London, Gidleigh Park is a great spot for a long weekend away, or perhaps as part of a longer trip including Devon and Cornwall as we did. 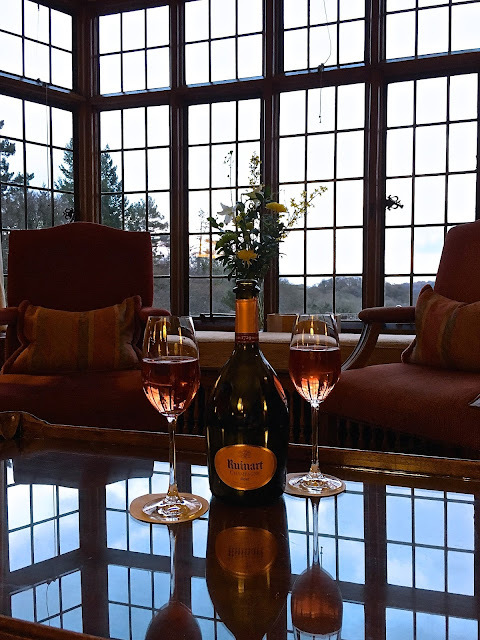 We left London around 3pm and arrived just in time for a quick freshen up before a glass of Ruinart Rose Champagne in the lovely drawing room followed by Michael Wignall’s 10 course dinner. What We Ate and Drank: We opted for the 10-course tasting menu. The food was sophisticated, delicate but richly flavoured and beautifully presented. 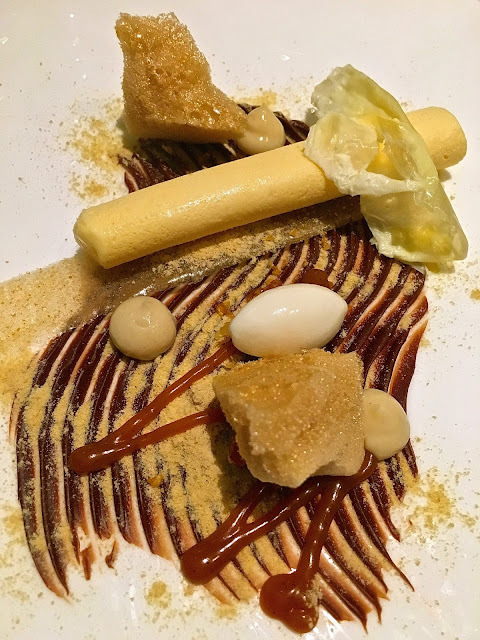 It would be hard to describe every element in each dish, in some cases there were dozens, but I have tried to give enough for an overview of Michael Wignall’s cooking at Gidleigh Park. Before the 10-course menu started, we were served 4 different amuse bouches - a small bowl containing trout caviar, fennel cured smoked salmon, frozen grapefruit, cucumber and horseradish. On a serving platter came the remaining dainty trio - steamed dumpling with truffle puree and grated truffle; lavosh sesame biscuit (a thin, crunchy Middle-Eastern bread) aubergine biyaldi and Madeira gel; linseed tapioca crisp, taramasalata, brown shrimp, yukiri seasoning – these were intricate, bursting with flavour and augured well for the meal that was to follow. 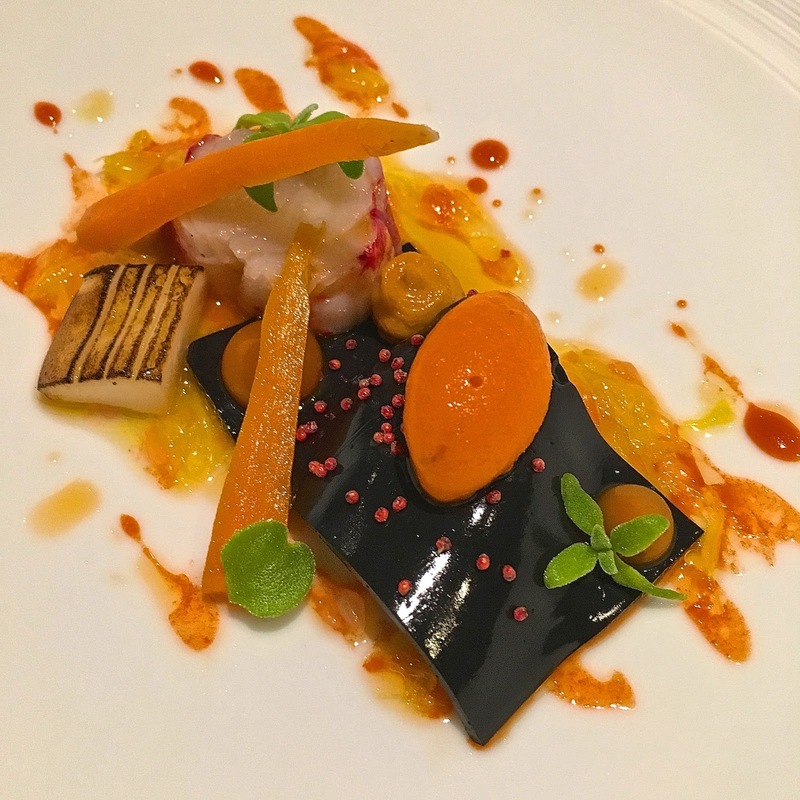 Cornish lobster came draped in a film of cuttlefish ink, with blow-torched cuttlefish, cardamom syrup, ice plant and textures of carrot – pickled, pureed and as a sorbet, drizzled with a refreshing citrus dressing. To accompany the lobster, we had a glass of Sancerre 2014 from Gerard Boulay - an elegant wine with flint and greengage fruit; a classic Loire Sauvignon. This was an intricate dish with a range of ingredients - Anjou squab pigeon breast served medium rare over a char-grilled calçot onion, with diced Alsatian bacon, pine oil, black quinoa, Aylesbury snail bolognaise in a reduction of Port and Madeira, salt-baked celeriac and celeriac cream. The composition made for a rich, earthy dish, and very well balanced. I particularly liked the flavours of the calcot onion, and the salt-baked celeriac was surprisingly tender and delicious. With the squab, we had a glass of Preludio 2013, from Bodega Juanico in Uruguay. Made from the Tannat grape which is a specialty of the country, this was one of my favourite wines of the evening - rich and complex, with black cherries, vanilla and cardamom. 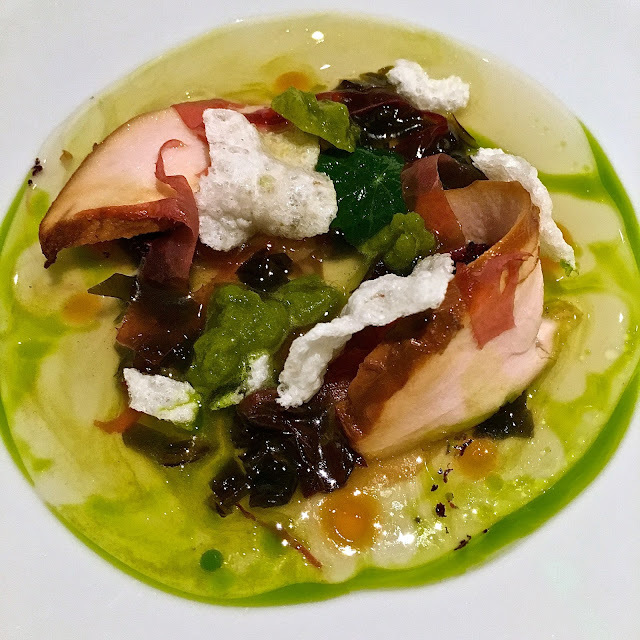 This had local Pipers Farm free-range chicken from Exeter with garlic panna cotta, frozen lovage, chicken skin crackers, chilled chicken broth, pickled black fungus and served with wakame and kombu jam. As if the list of ingredients were not long enough, I could also taste some Japanese umeboshi sour plum. This was a symphony of flavours and textures, really refreshing, and I loved the accomplished use of so many Japanese ingredients in this dish. To partner the Japanese elements, what better than a glass of sake? We had unpasteurised Kizan Junmai sake from Nagano in central Japan. This was full bodied with notes of pear and peach. The lemon sole was griddled and served with a gossamer-thin layer of Iberico lardo, langoustine, a savoury crumb made from romanesco and white cauliflowers and tarragon. Delicious little dots of black cream were scattered around the dish, made from black charcoal oil, squid ink and scallop emulsion, as well as pennywort leaves from the hotel garden. With the sole, we had a glass of Pinot Noir 2013 from Mount Beautiful, North Canterbury, New Zealand 2013. Aged for 11 months in oak yet delicate, this wine did not overpower the fish. The cassoulet of razor and palourde clams and cockles was served in a rich truffle-infused clam sauce and foam, with cuttlefish gnocchi, a poached quail egg and a crisp tapioca wafer. Accompanied by fried baby squid, edamame beans and shimeji mushrooms, this was my favourite dish of the meal, despite being the least photogenic. Accompanying the cassoulet, we had a glass of Cerasuolo di Vittoria Classico 2012 from Sicily. An organic wine made from Nero d'Avola and Frappato grapes and aged in clay pots, this had aromas of cherry and pomegranate, with a hint of farmyard. 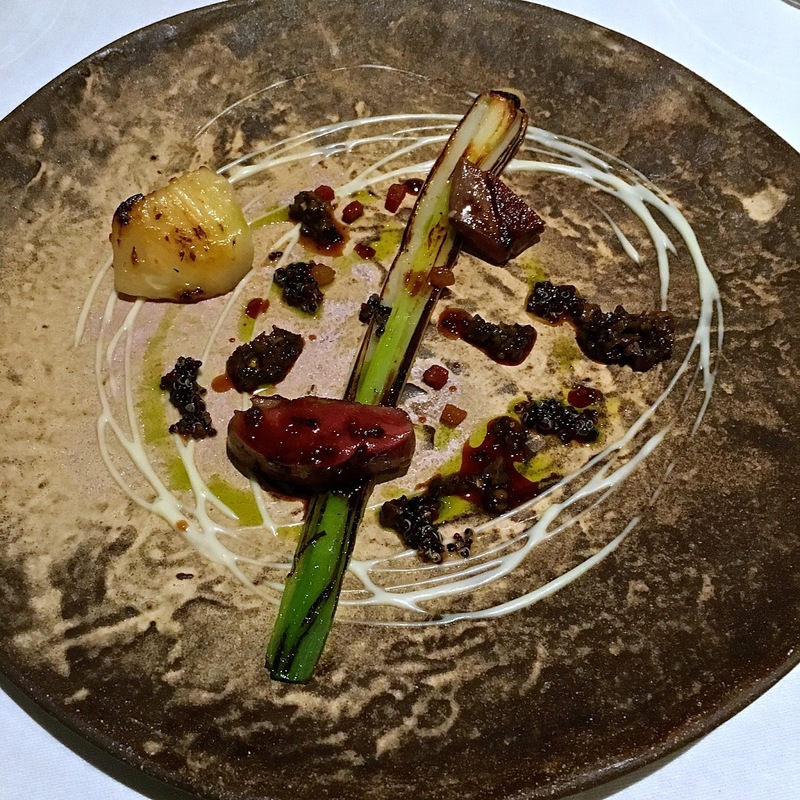 And just when you thought it could not get any better, the lamb course arrived - a sensational dish of local Dartmoor lamb loin, tongue and shoulder, served medium rare and meltingly tender. Accompaniments were eclectic but exquisite, including lightly smoked ricotta, morels, nasturtium oil and flower, wild and fermented black garlic, onion shells and white Japanese artichoke. I was pleased that the sommelier brought a Bordeaux wine for the lamb, a classic St Emilion. The Chateau Lessegue 2012 is a Bordeaux blend of Cabernet Franc, Cabernet Sauvignon and Merlot, and was a great example of its kind - with blackcurrant and blackberry, clove and cedar flavours and a long, complex finish. A cheese course but not as we know it, this featured a cheesecake of St Edburgha and Brie de Meaux, with a caraway and oat biscuit crumble, honey and caramelised walnut, pickled turnip and lightly charred nashi pear. The cheese had the texture of a mochi (a glutinous Japanese ricecake), and the combination of sweet and savoury was spot on. Pre-dessert was a sorbet of Gariguette strawberries (a traditional French varietal) both semi-dried and diced, with a black olive tapenade, basil, soft broken meringue and micro sponge. Sweet, refreshing and savoury all at once, this was a tongue-tantaliser for the remaining desserts to come. With it, we had a glass of Mas Amiel, AOC Maury 2013. An off-dry red wine made from 100% Grenache grapes in Roussillon, this had strawberry and cherry jam flavours that worked well with the sorbet. Dessert proper was a concoction of confit pumpkin, ginger cake, stem ginger ice cream, coffee and cream spherification, pumpkin ribbons and gel, and grue de cacao (nibs of roasted and hulled cocoa beans). We were served a glass of Clos Le Comte Sauternes, 2013 to accompany. An elegant botrytised sweet wine, this had ample honey, orange blossom and orange zest characteristics to match the luscious dessert. Pre-desserts are so yesterday, let me introduce you to the post-dessert! Wignall’s was a malt and yeast parfait frozen cream, milk skin, malt styrofoam, caramel ganache and caramelised candied walnut, garnished with Horlicks powder. A homage to the malted drinks of our youth, this was a creative and inventive end to the tasting menu. The last drink of our flight was a glass of 10 year old white Port, from Quinta Da Gaiovosa - a complex, dry fortified wine with rich chestnut and hazelnut flavours. The 10-course tasting menu at Gidleigh Park was definitely the best I have tried this year. The breadth of ingredients, the intricacy of the dishes and cooking techniques were outstanding, and for me this is what differentiates a two or three Michelin-starred restaurant from its one-starred competitors. Breakfast is included in the room rate, with a selection of fruit, yoghurt and pastries and fresh fruit juices. The main event is cooked to order, and we opted for a full English breakfast, with excellent quality bacon, sausage and black pudding. Eggs Benedict were flawless, on a toasted muffin layered with Palma ham, the hollandaise sauce lightly toasted to give a sizzled finish. For a gourmet getaway from London, there are few places in my opinion that will beat Gidleigh Park. 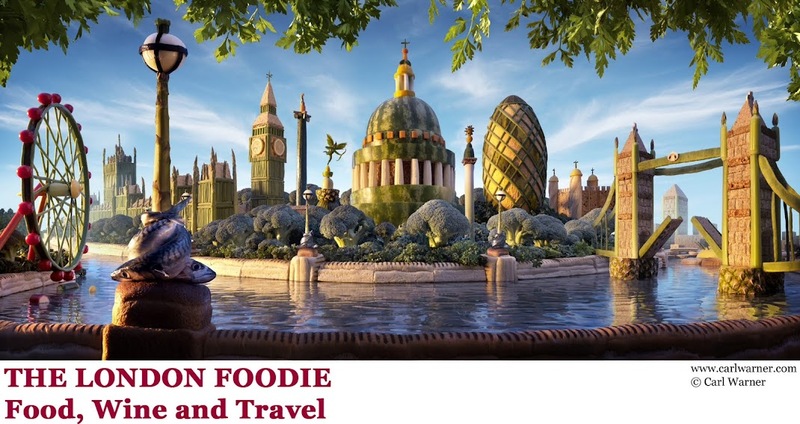 With rates from £439 per couple for a 7-course tasting dinner with bed and breakfast, and only four hours away from London, it is also a perfect location to celebrate a special occasion. Highly recommended. We travelled by car from London, it took us just under 4 hours to get to Gidleigh Park Hotel in Chagford via the M4, M5 and then the A30. To find the hotel, please visit their website here. If you are not driving, Gidleigh Park is a 30-40 minute taxi ride from either Exeter St David’s train station or Exeter International Airport. Gidleigh Park’s dinner, bed and breakfast packages start from £439 per room based on two guests sharing for one night. A Gourmet Get-away package is also available for £1,070 per room for 2 people sharing (or £535 per person) for 2 nights and includes a 7-course tasting menu on one evening and 10-courses on the other plus a hiker’s lunch or picnic hamper to enjoy on the grounds. 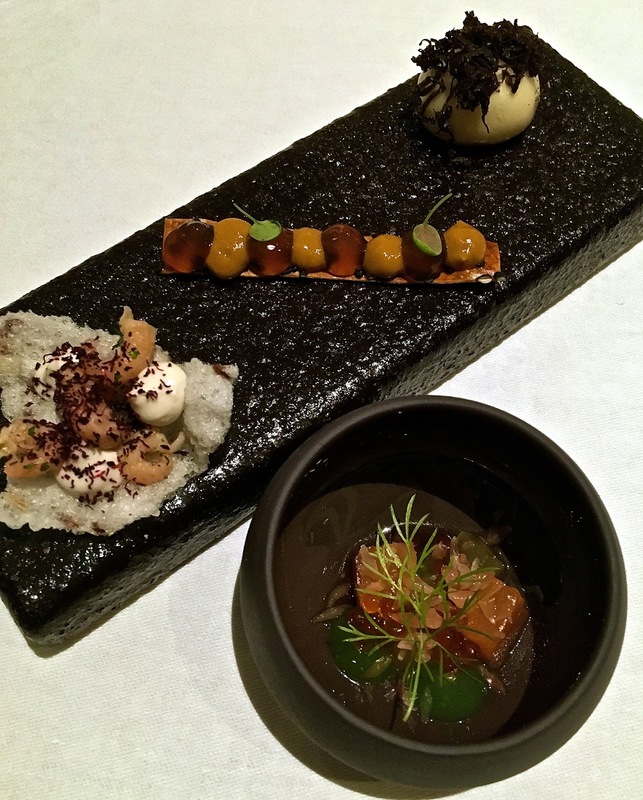 If you are only visiting Michael Wignall’s restaurant, there is a set-price menu for lunch available for £40 (Mon-Thu) or £50 (Fri-Sun) for 3 courses, which also includes amuse bouche and pre-dessert, so it is effectively a 5-course menu. For dinner, the 7-course tasting menu costs £110 per person, with an optional matching flight of seven wines for £65 per person. We opted for the 10-course tasting menu at £130 per person, with wine pairing at £85 per person for 9 glasses, chosen by Sommelier Renato Dellacorta. I stayed years ago, it's a gorgeous place.